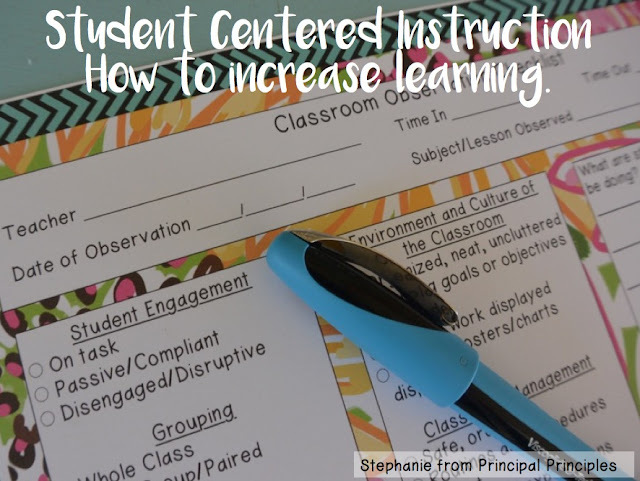 "Student Centered Instruction"- three buzz words we hear so much in education. What do those three words actually mean and how can you as the principal or assistant principal help your teachers increase learning? Student Centered Instruction means the focus is not on the teacher. The students are now the focus. How might this be? Students can easily become the focus on the lesson through active learning. Research has shown that when students are "doing" and not just "sitting" they learn more. In a classroom where students are actively engaged and learning, they are solving problems, working on a project, discussing and debating a topic, and formulating a solution to a problem. Let's face it- when students are actively engaged in the lesson, they are more motivated to learn. Let's relate as adults. How many times have you attended professional development and just sat and listened. You might come away with one or two things of value from an 8 hour training course. However, on the flip side, have you ever attended a training and you participated in the course? You were asked to move around, create a chart, share your ideas with a partner or your table, or role play? This kind of workshop you might typically remember and then the topic of the workshop tends to stick with you more. We want students: To collaborate. To be engaged. To be active. To be a participant. If you aren't seeing these in your classrooms, we need to stop and have personal conversations with the teacher after the observation. We need to provide our teachers with the kinds of trainings to move into this direction. Trust me - active engagement and students being the center of the lesson works. It works in all grade levels and with all students and abilities. We need to move away from lectures and "sit and get" type lessons- in all grades! 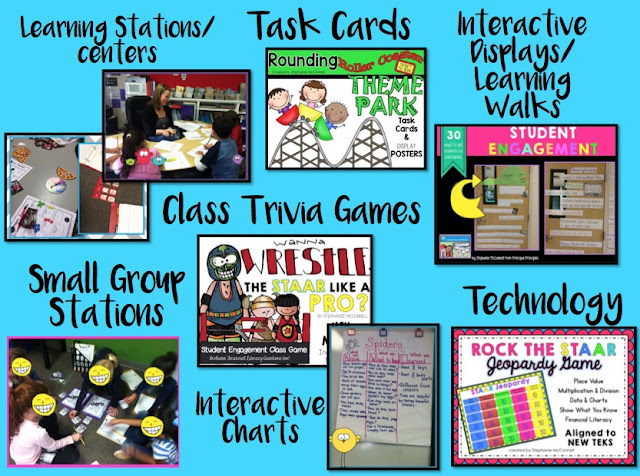 Students can participate in centers/stations, task cards, complete charts and graphs, Think-turn-Talk, etc... There are so many ways to get students actively engaged. Here are a few pictures of some active engagement activities. Below are 30 Interactive Student Engagement Activities in one spot. These are very easy to use. Just print. Laminate and put on a ring in your classrooms. Purchase this packet for every teacher on campus. These activities will be useful in all grade levels. Your teachers will be able implement these strategies easily. Instructional strategies such as group activities, hands on activities, differentiated instruction, etc... have been shown to greatly increase student engagement in learning. Students learn more and retain more information when they actively participate in the learning. 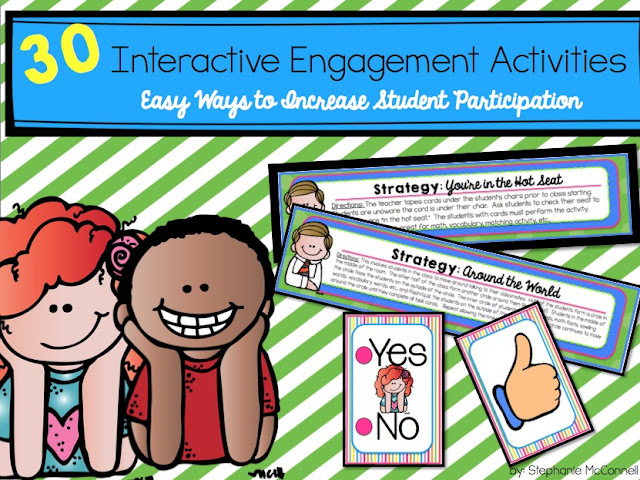 Let's help our teachers use more interactive engagement activities. When we do this, our students will perform at higher levels. If you need help getting started with this in your school, contact me so we can make a plan together.